I'm not sure if the animated skeleton is the most iconic Dungeons & Dragons monster, but it's certainly close. 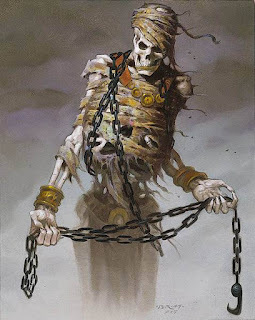 Interestingly there are few undead in Tolkien (other then the Ring Wraiths who are a clear inspiration for the wraith in D&D), but plenty in the other Swords and Sorcery inspirations for Dungeons and Dragons. 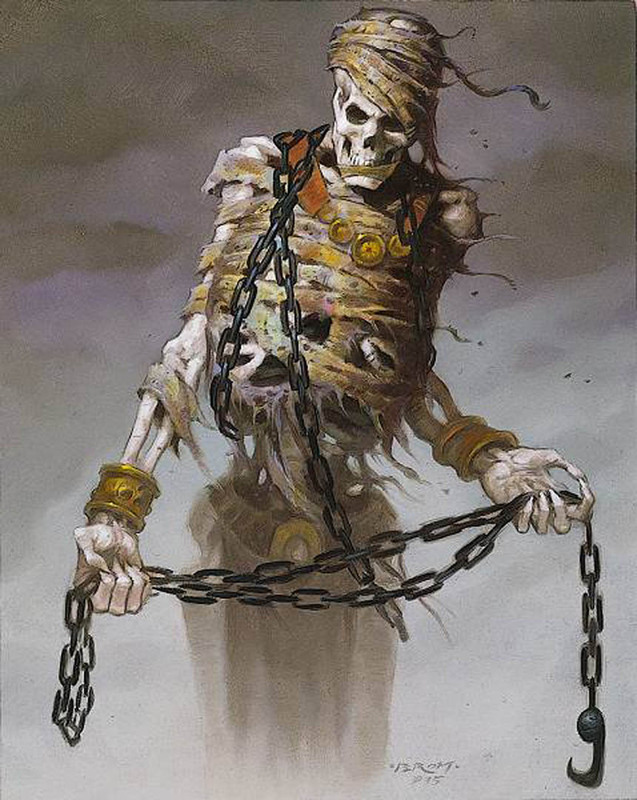 In the Monsters & Treasure undead are broken down by power level, but unlike humanoids each variety has some variation in abilities and a variety of statistical differences. Interestingly, Skeletons and Zombies are grouped as a single class of enemy with only minor indications that they might be considered different sorts of monsters. The taxonomic mania of AD&D is less fully evolved in the earliest editions of Dungeons & Dragons, with monsters having a variety of Hit Dice or types within a larger class and with almost none of the detail and ecology that defines later monster manuals. While this doesn't go as far in building a default setting for the game, that is a blessing of sorts, encouraging GM creativity and interpretation of these monsters and by extension the fiction they inhabit. SKELETONS/ZOMBIES: Skeletons and Zombies act only under the instructions of their motivator, be it a Magic-User or Cleric (Chaos). They are usually only found near graveyards, forsaken places, and dungeons; but there is a possibility of their being located elsewhere to guard some item (referee's option). There is never any morale check for these monsters: they will always attack until totally wiped out. The statline for Skeletons and Zombies (or animate bodies more generally) includes Hit Dice and Armor Class distinctions allowing for 1 Hit Dice(HD) or 1/2 HD and Armor Class of seven or eight. Possibly, or even likely, these distinction are meant to be the difference between Skeleton or Zombie as separate creatures, but such limited variety seems far less interesting then a mere random variation between creatures. Other more bizarre or interesting reading are possible, even if utterly unsupported by the text. One could reasonably use the higher stats for undead thralls that are undamaged, but the weaker set for ones that have been damaged (knocked to zero HP) after they get back up or reform. Another option would be to use the higher Hit Dice and Armor Class for creatures directly under the control of their creator, rather then left as guards. The animated dead in Monsters & Treasure are also something designed for use as war game opponents - figures on the field rather then narrated enemies in a table top Role Playing Game. Skeletons and Zombies are the bodyguards or an accompanying unit for evil priests and wizards rather then an enemy on finds while disturbing a tomb. These creatures chance of being in a liar is listed with a 'Nil' (Nil being one of those D&D anachronisms that while originally a shorthand slang for not on list and the Latin for nothing, has returned thanks to Gygax's esoteric brand of pedantry and autodidact's vocabulary). What this means it that Skeletons and Zombies are never in their own location, and never have treasure of their own - they are purely automatons, created and commanded by others.